Tiverton and Mid Devon A. S. events are held in the main hall at Blundell's Prep School at 7:30pm, usually on the first school-term Friday of the month. No previous knowledge of astronomy is necessary, so if you are at all interested you are very welcome to come along. 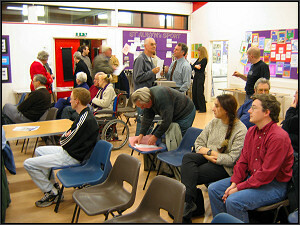 Many of us are regular attenders at our informal meetings, but a warm welcome is always given to new faces. For directions, please find us on Google Maps: visit maps.google.co.uk and type in the school's postcode, EX16 4NA. The school is on the south side of Blundell's Road. The school's full address is: Blundell's Preparatory School, Blundell's Road, Tiverton, Devon, EX16 4NA. This event is timed to coincide with the Perseids meteor shower. It is open to members and their family and friends and will be held in Paul’s lovely barn at 12 Park Hill, EX16 6RW. Please bring food and drink and RSVP to Angela if you would like to attend. Where do meteorites come from? Why do they strike the Earth leaving very little trace? How can we distinguish them from other rocks? DAVID DICKINSON will examine three places with meteorite remnants and one with very little evidence of its impact although future research will undoubtedly find an answer. Friday 5th October Ten Ways the Universe Tries to Kill You! From gamma-ray bursts to asteroid impacts, STEPHEN TONKIN will give an overview of cataclysmic events. This light-hearted but scientifically robust approach incorporates a lot of fundamental cosmological processes, from stellar evolution to galactic interaction. Some have called the HST the most exciting scientific project undertaken by mankind. MIKE DISNEY was involved from the start in its design, construction and exploitation. All kinds of scary and exciting things happened before the goods came home! Few people have heard of the Skylark sounding rocket yet, in November 1957, it was the first British rocket to reach space and became the basis of Britain’s earliest space programme. ROBIN BRAND will talk us through how hundreds were fired, launching thousands of scientific instruments into space. STEVE BENNETT will give us an update on the Starchaser Rocket Programme along with an interesting insight into how the human body behaves in space and the ways in which we cope. Friday 1st February If it Ain't Broke, Fix it! SIMON HOLBECHE feels the spirit of William Heath Robinson is alive and kicking in back gardens across the UK and will present an interesting guide to astro DIY successes and failures in one garden near Bath. Astrophysics is everywhere even if we don’t realise it. MARK WOODLAND will take us on a journey through the world of astrophysics from rocket navigation & black hole photography to parallel dimensions and other worlds. 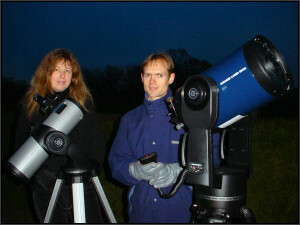 Wells and Mendip Astronomers have invited the members of TAMDAS to their Messier Marathon event. The evening will include a short talk and a tour of the observatory including their Fuller Telescope. Hot food and drinks will be available and there will a small charge of £3 to cover costs. The Society’s Annual Dinner will be held at The Globe Inn, 14-16 Lower Town, Sampford Peverell. EX16 7BJ. Further details and menu choices will be given nearer the date. After a brief AGM, MIKE BROWNE will take us to the beautiful medieval walled town of Nördlingen in Bavaria which sits in the centre of a huge ancient meteor crater 20 miles in diameter. The crater formed around 15 million years ago and up until recently was thought to be volcanic in origin. What has this got to do with Willy Wonka? Mike will reveal all in this historic and fascinating story. What did we get from the moon and what is its legacy? It is almost 50 years since the first boot prints were left on the dusty surface of our distant Moon. DAVID BAKER, an Apollo veteran, talks about those exciting days when humans first left Earth and stood on the surface of another world in space. But what was it like - and what did we get back from six visits which unlocked secrets about our own planet and its fragile environment we would never have known about had we not gone? This ever popular event is open to members only and will be held in Paul’s lovely barn from 7:00pm, at 12 Park Hill, Tiverton, EX16 6RW. Please bring food and drink. Torbay businessman Richard Arundal will discuss the research arm of Arundal Aeronautics Ltd, focusing on the field of on-orbit manufacturing. An orbiting facility that manufactures large spacecraft subsystems (such as antennas) which could revolutionise the way space is used and enable new space mission concepts. The purpose of this research is to design a mission concept that will utilise high-power lasers in space to use as manufacturing tools. Current theories of galaxy formation predict many more galaxies than have currently been found. Could it be that the galaxies are there, but they remain dark? Dark in the sense that they only contain 'dark matter' or maybe just gas or possibly become stars, but so few that they are very difficult to detect against the brightness of the night sky. Jonathan Davies will discuss these issues and describe some of the work he is doing at Cardiff University to reveal the Dark Universe! Paul Bennett's Lunar Mission One has been in the planning for 7 years. An exploratory robotic mission that will use innovative drilling technology to deliver extraordinary new insights into the origins of the Moon and the Earth. It will also be fully international with many countries working together and enabling people from all walks of life to be involved. Society member John Parratt gives a fascinating insight into some amazing women who have made outstanding and significant contributions to astronomy, dating back as far as the 5th Century. Bud Martin Budzynski will begin with a little bit of history regarding the Red Planet, then examine the engineering challenges of travelling to it and the problems for humans to get there... and back! Chris Starr will show what we have learned throughout history about Saturn, and what an amazingly diverse system it has proved to be with information from the highly successful Voyager and Cassini missions. Friday 2nd March Ten Ways the Universe Tries to Kill You! The society's annual dinner will be held at the beautiful Fisherman's Cot, Bickleigh, Tiverton, EX16 8RW. Further details and menu choices will be provided nearer the date. After a brief AGM, renowned astronomer Paul Money will take a look at the amazing discoveries the New Horizons mission has made at Pluto. Ever since astronomers started observing the night sky, they have dreamt of finding a 'second Earth'. In the last 20 years, we have identified over 3000 planets outside of our Solar System, many of which lie in the 'Goldilocks Zone'. Mark Woodland will look at how these planets have been discovered, the background science, some of their weird and wonderful characteristics, and look at the future of exoplanet science. This ever popular event is open to members only and will be held in Paul’s lovely barn at 12 Park Hill, EX16 6RW. Please bring food and drink. Elisabeth Matthews will demonstrate how she is attempting a different method to directly image exoplanets and will explain why it is important and what she is hoping to find. The Society welcomes back the very witty and entertaining astronomer Paul Money to talk us through some more images which have inspired him to do what he does best! This year’s annual dinner will be held at the Hickory Inn at Halberton EX16 7AG. Further details and menu choices will be available nearer the date. Hugh Allen will use some of his telescopic observations to illuminate the impact of binary stars on the history of science and astronomy. The story will naturally lead to binary black holes and gravitational waves. 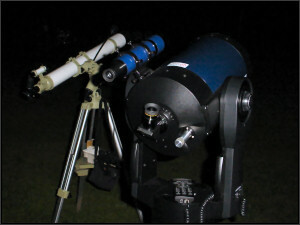 Do you own a telescope that you can’t get to grips with but want to use on those starry nights? Members will be on hand to show you how to get the most from your scope. Please contact Angela on 01884 243 186 to book yourself a place on this FREE workshop. Highly renowned astronomer David Strange has been imaging the night sky for the past 50 years and will show a selection of the most intriguing objects he has captured during his life time of observing. Paul Roche will tell how the ESA Gaia space mission is set to revolutionise our understanding of the Milky Way Galaxy and will map around 1 billion stars over the next 6 years - and also spot many other transient targets that need to be followed-up from the ground. Through the Faulkes Telescope Project, UK schools and amateurs will be able to participate in the ground-based follow-up programme, helping discover new supernovae, novae and other exotic objects. Society Member Jo Richardson will share with you a day in the life of a Space Ambassador. She runs her business Space Detectives and works with the European Space Education Office and National STEM Centre and is busy delivering the Tim Peake Primary Project. Learn what it means to inspire the next generation using the context of space. Founded by Sir Norman Lockyer in 1912 the observatory was a centre for astrophysical and geophysical research until the 1980’s. Today the observatory is managed by unpaid volunteers to support science education. Further details for this society visit will be given nearer the time. James Fradgley shares his not-so-technical view on how different sorts of planets and other bodies came to be where they are. After a brief AGM, enjoy the fascinating story of this world famous telescope as told by Gresham College Professor of Astronomy Ian Morison. Hear how the 60-year-old Lowell Telescope is better now than it has ever been and through its role in the MERLIN and European telescope arrays continues to play a leading role in astronomy. Friday 2nd June Dust: It Gets Everywhere! Dust is all around us, both on a planetary and galactic scale. In his talk Sam Morell will take you on a grand tour of dust and its effects on us as a species and as astronomers. This ever popular event is open to everyone and will be held on the field behind Blundell’s Prep School. Please wrap up warm, bring telescopes, food, drink, chairs and a small table if you have one. Should it be wet it will, unfortunately, have to be restricted to members only due to a shortage of space and will be held indoors in Paul’s lovely barn at 12 Park Hill, EX16 6RW. Please bring just food and drink. Our youngest member Alex Richardson begins our programme with his short talk which will be followed by a talk from John Parratt who will explain the different types of telescopes and how they work. A brief look at the history, nature and effects of rocks from space with Ron Westmaas. Our first annual dinner will be held at the Beambridge Inn, Wellington TA21 0HB and is open to members and friends of the Society. After a sumptuous meal we will hold a light-hearted auction to raise funds for a CCD camera for use with our telescopes. Brian Sheen will explain how Climate Change is a real and present danger which astronomers can understand and quantify. This talk will review our current knowledge and highlight ways in which we can get involved. The renowned Dr Andrew Morse is part of the research team that built “Ptolemy” an instrument on board “Phileae” which, despite the challenging landing, managed to return information about the chemical composition of the comet. This promises to be an enlightening talk from the brilliant Hugh Allen who will set us ablaze with sparkle and rainbows! What are the prospects of finding life, simple or intelligent, beyond our planet? What do we know already and how do we hope to discover more? Gresham College Professor of Astronomy Ian Morrison will give his own thoughts about how likely our quest will be achieved. In this talk Ian Walsh shows how to get a perspective and understanding of the large distances and units of measurement used in astronomy which many find difficult to comprehend. Founded by Sir Norman Lockyer in 1912 the observatory was a centre for astrophysical and geophysical research until the 1980’s. Today the observatory is managed by unpaid volunteers to support science education. After our usual very brief AGM, Society Member Bob Howard explores the idea that there may be more to time than we think. A very welcome return to Bob Mizon MBE who has headed up the Campaign for Dark Skies for many years. Sit back and enjoy this alphabetical tour of the Solar System which will reveal many amusing and quirky facts along the way. If the evening is a dry one this event will be open to everyone and will be held on the field behind Blundell’s School. Please wrap up warm, bring telescopes, food, drink, chairs and a small table if you have one. Should it be wet, it will be held indoors in Paul’s barn at 12 Park Hill, EX16 6RW. Due to a shortage of space it will, unfortunately, have to be members only. Please bring food and drink. Update: this event will indeed be hosted at Paul's, as the weather is forecast to be overcast and possibly raining. Professor David McMullan of Plymouth University has kindly rescheduled this meeting to help us understand this fascinating and mysterious subject. Most of what we know about our Universe comes from the study of light. Professor Peter Vukusic from Exeter University is a very engaging and passionate speaker on this subject. British company Starchaser is building rockets which are set to open the frontiers of space for everyone through Space Tourism. Starchaser founder Steve Bennett talks about the project from its humble beginnings to where the realization of his childhood dream will ultimately lead. Come and enjoy some astronomical fun and games hosted by Angela and Jo. Please bring a small amount of drink and nibbles to share. Darryl Sergison of Exeter University will demonstrate the way in which stars are formed in nebulae and show how this determines what type of star they will grow up to be! Chris Starr of Wells and Mendip Astronomers will take you on an exciting adventure through the Universe. Sit back and enjoy the ride. Paul Money will show 10 images and explain how they inspired him to become a very popular and renowned astronomer. It is hoped that a trip to the Met Office’s new Space Weather Centre in Exeter can be arranged. NB: the Society’s AGM will now be held in May each year. Following this our own brilliant astrophotographers John Parratt and Pete Richardson will share some of their secrets as to how they achieve superb images of the night sky. Andy Burns is the former curator of the Herschel Museum and the world's leading expert on John and William Herschel. UPDATE: Original guest speaker Nick Howes is no longer able to attend this month to give his talk on the Faulkes Telescopes, so this month's talk will now be given by Andy Burns on the subject of John Herschel (as above). Roger Dymock of the BAA Comet Section explains the search for comet hunters in amateur societies. See www.britastro.org/projectalcock/ for details. 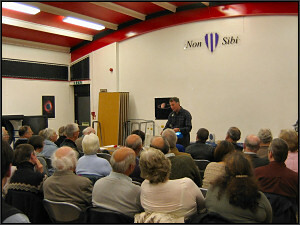 An explanation by Tony Deyes of Torbay Astronomy Society. Hosted by Carol Boote who promises no starry flags this year! Bring festive food and drink to share in the interval. Mark Gibbs, head of space weather at the Met Office, gives us an insight into the effects of the sun’s activity. Friday 7th February Dark Matter and Dark Energy - CANCELLED: Prof. David McMullan of Plymouth University can no longer make it to the meeting owing to the recent disruptive weather. Considering that further stormy weather has been forecast for Friday 7th February, the meeting has been cancelled. Dr Andy Young from the University of Bristol gives us a chance to extend our ideas (or body) as we enter the realms of these mysterious entities. Stephen Tonkin, Fordingbridge Astronomers, and Sky at Night contributor, shows us what to look for, with observation afterwards if it’s not cloudy. See a PDF document of Stephen's talk (2.7 MB). Douglas Rice, our very own polymath, will entertain us. 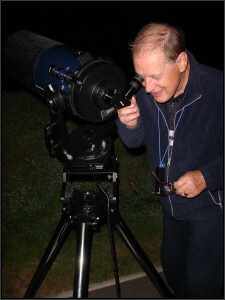 We welcome back Bob Mizon, MBE, FRAS, Co-ordinator of the Campaign for Dark Skies. Tonight he suggests what we might see if our observing site is less than truly dark. Martin Griffiths, FRAS, University of Glamorgan, gives us a fascinating description of how and why faint, fuzzy deep-sky objects were catalogued by the great French observer. Guy Hurst, Editor of The Astronomer, will tell us how much amateurs can contribute to current professional research. A light-hearted quiz with Carol Vorderman Boote! Bring festive food and drink to share in the interval. There will be prizes! Dr Steve Bell, Head of HM Nautical Almanac Office in Taunton who calculate and provide data on when/where eclipses will occur. Members will contribute ideas of websites and applications that help you get the most from your interest in Astronomy. This is a gala evening to end our year. We are delighted to have David Haines (composer) to narrate and lead the Teignmouth and Ivybridge Community Choir in a performance of his work, which is beautiful, inspiring and scientifically accurate. Bring and share supper. This is one you won't forget! Please note that this event will NOT take place at our regular venue, but at TIVERTON HIGH SCHOOL instead. For further information click here. Damian Peach, renowned planetary photographer, will show some of his amazing images and photographic techniques. James Fradgley of Wessex Astronomical Society reveals his diverse expertise, which includes Arcturus, Lagrange Points and Night Vision for Astronomers; with audience discussion. We welcome back Lilian Hobbs, enthusiastic amateur astronomer and published author. Friday 3rd February Is Anybody Out There? With David Love of Torbay Astronomical Society. Society members will speak on areas of their own interest. Telescopes will be set up on Saturday evening under Exmoor’s dark and hopefully clear sky, camping available overlooking the water. Learn from Duncan McLean, an expert on how rockets and their payloads are put into orbit and maintained there. Artist Chris Williams shows how he translates astronomical data and concepts into fascinating abstract forms. The History of the Science of Light explained by Steve Duncan, an officer of Torbay Astronomy Society, who works as a scientist in the space industry in Bristol. Royal Astronomical Society prize-winner Dr Elizabeth Stanway speaks about the most distant objects. We welcome back Professor Mike Disney from Cardiff University to explain the mysterious subject in which he specializes. Dr Nathan Mayne of the University of Exeter will tell us about star formation. Gavin McLaren, an experienced sailor and compiler of Admiralty Guides, reveals how it’s done. Robert Law, Curator of the Mill Observatory in Dundee, gives helpful advice on using simple equipment. Look out for the meteors at the Sportsman's Inn, Sandyway, EX36 3LU (Tel. 01643 831109). There will be a talk inside if it's cloudy. Our chairman's talk has a topical theme to commemorate 40 years since the first Apollo landing. See Jupiter through a telescope or see a talk by North Devon AS if it's cloudy. 8:30pm at the Sportsmans Inn, Sandyway, EX36 3LU (Tel. 01643 831109). An introduction to the techniques now being developed which will lead us to new frontiers. Look out for meteors from 8:30pm at the Blue Ball Inn, Countisbury, EX35 6NE (Tel. 01598 741263). There will be a talk inside if it's cloudy. With North Devon Astronomy Society, see the Moon and Jupiter from Pinkery Outdoor Education Centre, 8pm. Some spacecraft trajectories seem to disagree with modern physics - what does this imply? Suzanne will explain her research at Exeter University, finding and characterising extra-solar planets. See meteors from 8:30pm at the Sportsman's Inn, Sandyway, EX36 3LU (Tel. 01643 831109). Put on coloured glasses and enjoy dramatic new pictures. See some amazing images taken by a local amateur astronomer. Pat will explore the theories of dark matter and energy and why most of the Universe is missing! 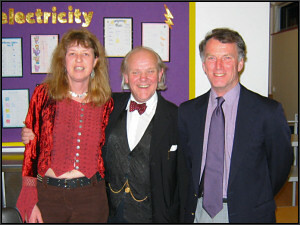 UPDATE, 02/03/2010: Unfortunately our speaker has had to cancel owing to illness. Instead we will enjoy an informal evening of home-made entertainment: please bring an object, picture, book or idea with some astronomical connection for people to look at and chat about. If you have a telescope, bring it too and let’s hope for a clear sky. A trip to see the historic telescopes and new facilities at Sidmouth. A spellbinding account of some great astronomical pioneers. Three talks from members about their astronomical interests. Friday 8th August Starbecue - 20:00 to 20:30. Bring food, drink, deckchair and, if you have one, a telescope for a supper under the stars! An insight into how astronomy, in this unspoilt region of Northumberland, has hit the heights with the creation of a new observatory. This is a tale of how sheer determination paid off, resulting in this fantastic facility aimed at outreach and research. The stunning images have to be seen to be believed! Robots are proving ever more useful in space exploration. Alan will discuss artificial intelligence and show the interactions of robots with their surroundings and with other robots in a group. Back by popular demand, Mike will be tracing backwards to show how far we can really go to understand the Big Bang. Vic will discuss the delivery of material to Earth that may have been the building blocks of life itself and may have seeded other Solar System surfaces with molecules needed for pre-biotic chemistry. Modern astronomy uses much more than just optical telescopes. Derek will show how infra-red and other long wavelengths have opened up many of the mysteries of the Universe. Friday 6th February Astronomy with Adaptive Optics (Jenny Patience) - talk will now be given in March. Adaptive Optics systems on telescopes measure the effects of the atmosphere and correct images, greatly improving resolution. Studies include: orbital motion of asteroids, stars at the galactic centre, storms and volcanic activity in the Solar System, and disks/companions of young stars. Tiverton & Mid-Devon AS members have been invited by Lucie Green to tour the Mullard Space Centre and gain a close up look at their work and latest missions. Costs will be approx £20 per person. There will only be 18 places available on the trip, so please let Angela know ASAP if you would like to book. Dr Hatchell's talk discusses sub-millimetre astronomy. After a brief AGM, Arthur will share with us some of the highlights of the many astronomical adventures he has had over the last 50 years. He will also show many of his fantastic images, developed himself. Friday 10th August Starbecue - 8:00 to 8:30pm. Bring food, drink, deckchair and, if you have one, a telescope for a supper under the stars. A fascinating insight into a potential new energy source for the 21st Century. To commemorate the 50th anniversary of the launch of Sputnik 1, Andy will tell the story of the world's first artificial satellite in this dramatic presentation. Enjoy a short presentation of some amazing images taken by students of Blundell's School and Tiverton High School using the Faulkes Telescopes. Then learn why physicists and engineers have built the world’s highest energy particle collider at CERN near Geneva. Vince works on this project and will speculate on some of the things that may be discovered. Modern astronomy uses much more than just optical telescopes. Derek will show how infrared and other long wavelengths have opened up many of the mysteries of the Universe. 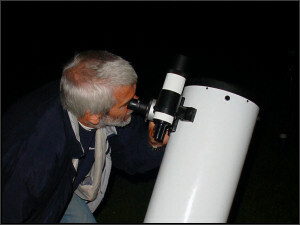 Discover how to observe Charles Wood's 100 lunar objects using just a small telescope. A look at the life of the most massive stars that produce 90% of the light in the Universe and die in spectacular supernovae explosions. NASA, Japan and ESA have collaborated to produce the STEREO and Hinode missions. Using 3D videos Lucie will explain how she and her team will track eruptions from the sun's surface through space to Earth. Thomas Harriot was an English astronomer and a contemporary of Shakespeare. He heard of the "Dutch Spy Glass" in 1608 and was the first person to observe sun spots and other astronomical phenomena - before Galileo. After a brief AGM our member Ian will explain the important role that angular momentum plays in keeping the Universe the way it is. Friday 9th January Visit to the University of Exeter Observatory. Meet at St. Aubyn's. April Trip cancelled - our apologies to those who were keen on the idea!